"Mikey, don’t touch that." The little pre-school aged boy pulled his hand slowly back from the bag of chips he had been reaching for. "Michael, Mommy says don’t touch ANYTHING." Again the little boy pulled his hand back--this time from the box of cookies--watching his mom as she moved on down the aisle of the grocery store. She added some snack crackers to the shopping cart while talking babytalk to the fussy, whining baby sitting in the seat of the cart. "Come on, Mikey." After a moment Michael followed. They turned down another aisle, moving by and around other shoppers. Several things were added to the cart. The baby cried. "I want cookies," demanded Michael. "No," said his mom, picking up a can of green beans and then a bag of noodles. They moved on. "I want cookies – cook-ies – cook – kook-eyes – cook-ies," sang Michael. "Want cook-ies – kook-eyes." "Mikey, please be quiet. If you’re quiet I’ll get you some cookies. Okay, Mikey?" His mom was getting more flustered as she tried to finish her shopping. Michael knew he had her going now. "Goodie, goodie, goodie," he sang. "I’m going to get cookies - cook-ies – kook-eyes." "Mikey, be quiet," wailed his mom while the baby echoed her. She checked her list. "Need to get milk, juice, and baby cereal. And some hamburger." She added a jar of pickles to the cart and crammed a pacifier into the mouth of the crying baby. She wished she could give one to Mikey, too. "Cookies, kook-eyes. I want cookies – kook-eyes, more kook-eyes. Kook - ." Michael stopped singing. "Mommy, Mommy. What’s that? Mommy, are those eyeballs?" Michael pointed to a jar. "Those look like eyeballs, Mommy." He took a step backward. "Mommy, that jar there. The eyeballs are moving. They're rolling around in the jar, Mommy, how do they do that?" "Of course not," said his mom, hardly glancing at where he was pointing. "Those are olives, Mikey. Come on." "No, they're not 'lives. They're eyeballs. Kook-eye balls. They're looking at me. Make them stop looking at me. I don’t like kook-eye balls." Michael grabbed his mom around the leg and hid his face, then peeked back at the jar. "Stop that, Mikey, they're only olives." She pried him loose from her leg. Michael looked back at the jar. 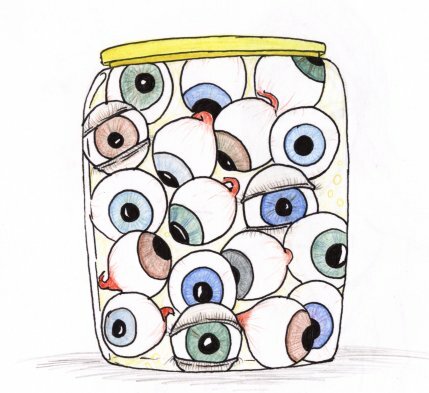 "Don’t look at me, kook-eyes," he yelled, and flung a small fist at the jar, barely grazing it. But it was enough to cause the jar to fall to the floor where the glass shattered and the contents rolled here and there, helter-skelter. "Mommy! The kook-eyes jumped off onto the floor!" "Now look what you’ve done, Michael!" "They jumped, Mommy! Honest they did!" "You’re going to get it now, Michael! Do you hear me? Your in ….in….trouble….now..." Her voice slid to a halt, as she took in the sight of the broken glass and the still rolling--jumping and rolling--eyeballs. There were hazel eyes, blue eyes, brown eyes, and green eyes; some with the eyelids still attached. And all those many eyes were staring at her. As she watched back, her mouth still open, she gave a little screech. Then one of the eyeballs winked at her. "Mikey, we’re leaving NOW!" She grabbed the boy by the arm and dragged him with her while pushing the cart with the screaming baby toward the nearest door.